Need to Create Custom Boxes for Your Products and Services? Options are Endless. Posted in Ad Agencies, Advertising & Promotion, Blog, Corporate Branding. If you are looking for the best customized boxes for your products and services, you are at the right place. Custom boxes are manufactured in a very unique way, just as the customers want them to be designed. The customized boxes come in different handy designs and graphics printed on them. Customized boxes can be made using different materials. The sizes vary depending on your desires. The inside is also customized to your satisfaction as a customer. You can make an order for the manufacturers to get what you want at the agreed price. The designers are purely professionals with vast experience in designing these boxes. Posted in Advertising & Promotion, Blog, Corporate Branding. How can you speak to your customers without saying a word? 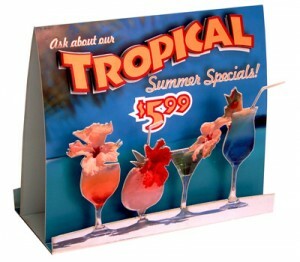 Table tents and counter top displays can effectively get your message across.